Thank you to The Clausen Gallery! We are thankful that they were available at such short notice. They captured our bridal suite, ceremony, reception, and special moments. Talented photographers with quality equipment. Very affordable rates and we got our images less than 2 weeks from our special date. Quality services at affordable prices. The Clausen Gallery was amazing! As a bride I wasn't sure how to organize my photo timeline for my wedding and Matt was so helpful and made sure I was comfortable with the timeframe for each section of the day. He made sure that I had plenty of pictures not just "staged" but candid picture from all my guest. I received my wedding pictures super fast and was so in love with all of them. The Clausen Gallery did wonderful work. I am so glad I chose to go with The Clausen Gallery for my wedding photos. Not only did the pictures turn out amazing, but Matt and Jessica were great to work with! They are super flexible, fun to be around, and do a wonderful job at capturing every moment. I absolutely that an amazing experience with The Clausen Gallery! 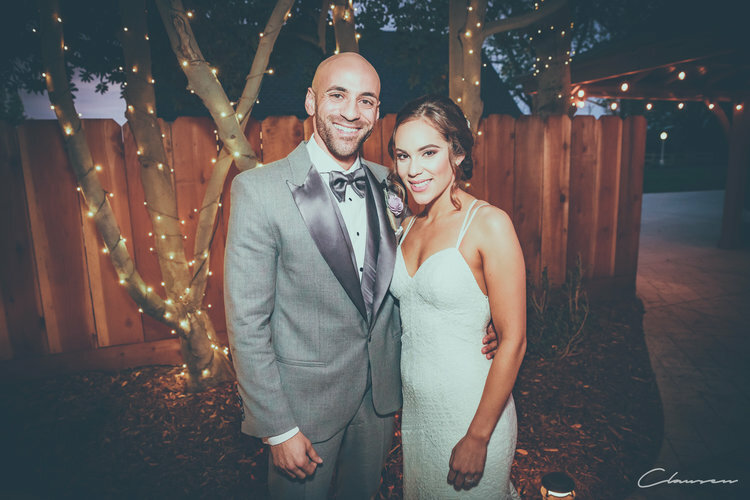 Matt was very responsive and flexible throughout the entire wedding planning experience. The day of our wedding Matt did an amazing job capturing beautiful photos, he has a great upbeat, happy personality! He smiles and laughs all day long which is wonderful to be around. We received our wedding photos in a timely manner, we actually had them by the time we came back from our honeymoon! I highly recommend The Clausen Gallery to capture your wedding, you will definitely SUPER HAPPY with the job! Matt came to the rescue for me and my husband on our wedding day! His photos were beautifully done and all my guests loved him! He was fun and always willing to help! I could not have asked for a better photographer. I will continue to praise him and give his business card to everyone I know! We couldn't have found a better photographer then Matt Clausen! Not only was he reasonably priced but he was worth so much more than we paid, he took so many wonderful shots and went along with all the pictures requests we asked for! He was always taking pictures of something, so we have pictures of every part of our wedding! Another thing about Matt Clausen photography was when chaos started with getting things ready for the wedding, he jumped right in to help! He went above and beyond what a normal photographer would have done! Hire him, you won't be disappointed! Matt was amazing. He showed up to the wedding early and right away started taking pictures. He stayed until everyone left and took pictures the whole time. The pictures were done quick and look amazing. He captured all the best moments of the wedding setting up and all. I highly recommend him. You'll be truly happy with his work! My wife and I got married in Las Vegas and Matt was able to be there take incredible pictures for us before and after the wedding. He chose nice places to take our photos. Our wedding pictures came out Amazing! I'm very please with how they came out after he took them edited them. He Definitely did better than what I was expecting. Memories to cherish forever. Thank you Matt!! Matt is an amazing photographer!! Very affordable, easy to work with and very friendly. He took amazing photos at our wedding. Beyond satisfied with his work!! Best part is having our pictures done and delivered in under 2 weeks! Matt was absolutely wonderful to work with! He made the whole process much less stressful by answering text messages and emails very quickly and even made a trip out to our venue with us to do a walk-through of where we wanted pictures taken and where our ceremony would take place. He may be only one person, but he got such a great number of shots from different angles of our ceremony that you would’ve thought he had several partners! He stuck with us for the entire duration of our event and made sure that we had every picture and pose that we wanted. We had a 12 picture highlight album to enjoy together only three days after our wedding and then we had our entire wedding album delivered to us the day after we got back from our honeymoon! You will not be disappointed if you work with Matt for your wedding! Amazing quality and professionalism. Very easy to work with, did a great job working with us and our schedules. Overall best experience we could have had. Would recommend to any and everyone looking for a great photographer with great skills behind the lens. I couldn't have asked for better service. Having other vendors that did not communicate well made me appreciate the responsiveness from Matt. He was professional, he listened to what I wanted, and made my entire group of friends and family feel comfortable the day of the wedding. Beyond happy with the finished photos. Matt is absolutely wonderful he made our big day so worry and hassle free. From the moment he showed up when we were getting ready we didn’t have to ask him which pictures to take or what to do he just got right to work and took the best candids. If we had any special requests throughout the day he was more than happy to take the pictures the way we wanted. He stuck it out with us all day and was even part of the party! I highly recommend Matt to anyone looking for a photographer that is both highly invested in their work and also amongst the most reasonable in price in all of this area! Matt thank you from the bottom of our hearts for making our day so memorable and capturing such beautiful moments. My wife and I couldn't have asked for a better photographer. Absolutely amazing and definitely will recommend them to everyone we know. Thank you so much Matt and Jessica for everything you did and all the memories we will have!! The Clausen’s are an amazing team!! They were great to work with, always willing to meet up or answer questions via text if we couldn’t meet; the photographers came out so fantastically! My husband and I were looking for something different (our whole wedding was non-traditional) and they were on board for every odd ball idea we threw at them and they ran with it. I couldn’t be happier with them, and we plan on using them for future events! Matt and Jessica were AMAZING! They really know how to make our wedding experience memorable and took amazing photos. They were part of the family on our day and we were so lucky to have them capture every moment. I highly recommend their services. You will not be disappointed! Matt & Jessica were the perfect photographers for our wedding! They were very professional and responsive. The amount of time spent with us for the price was an incredible deal! Not to mention - the creative, magical photos that turned out were beyond beautiful! Thanks to the two of them - you really can't get better photographers! Matt and Jessica are professional and so easy to work with. We felt that we can communicate with them and they would do their best to make it happen. They also offer their services at reasonable price. We are so happy that we found them to be our wedding and engagement photographer. We highly recommend them. Matt was great to work with. So easy going, reliable, and a great photographer. What can I say about Matt and his amazing work? His prices are fair, the photos are breathtaking. We hired him to take photos at our wedding and he was so patient and willing to take any photos. He was not in a hurry to leave and made sure that we where happy. By the end of the day he felt more like a friend doing us favor. The pictures were breathtaking. I would definitely recommend him to anyone! If we could rate more than 5 stars we would. Thank you Matt!!!!! !